Q: What are Inflatable Bouncers Made of? A: 0.55mm PVC vinyl, 1000D durable laminated cloth, high strength, lead free, water proof, fire retardant and UV protective to withstand up to 120 degrees in temperature. Besides, we use high quality interior baffle materials and durable nylon threads. Q: How do you do reinforcements and make high quality bouncers? Q: Can add logo printing on Inflatable Bouncers? 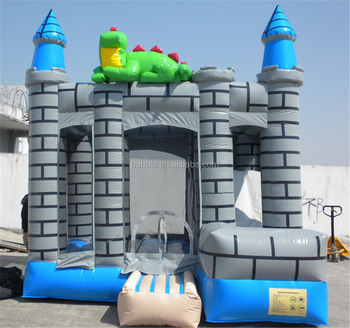 Q: What can we add for Inflatable Bouncers? 4). Climb, slide, pool, tunnel, basketball or obstacle functions --- Some designs already include. Q: What kind of mesh/nettings to make Inflatable Bouncer windows? Q: How to blow up Inflatable Bouncers? Q: How many air blower hoses on an Inflatable Bouncer? Q: Can we use Inflatable Bouncers in winds? Q: Can we use Inflatable Bouncers in rain? 2. Material: 0.55mm PVC vinyl, 1000D durable laminated cloth, lead free, water proof& fire retardant and UV protective.High quality interior baffle materials and durable nylon threads. 12. Payment: 30% deposit, by T/T (telegraphic transfer), Western Union, Money Gram, Pay.Pal, Secure Payment, Trade Assurance.